Paid family leave has recently become a hot topic not just for Democrats but also for Republicans. The lucky few employees who already have access to paid family leave are paid fully or partially for long leaves from work for reasons that typically include caring for newly born or adopted children, seriously ill children, or other sick relatives such as parents, grandparents, or siblings. Paid family leave is not the same as sick leave for minor illnesses but rather is used when employees need longer absences from work. Today, about 13 percent of workers have access to paid family leave, according to the National Compensation Survey from the Federal Bureau of Labor Statistics. 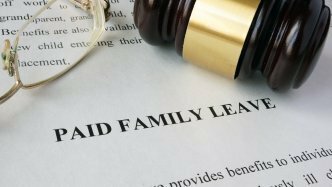 Currently, there is no federally mandated paid family leave law, but the Family and Medical Leave Act of 1993 provides unpaid leave for employees of businesses with 50 or more employees, with some exceptions. However, federally mandated paid family leave is increasingly gaining support, though the plans promulgated vary extensively. In December 2017, Congress passed H.R. 1, a measure that gives tax incentives to employers who voluntarily offer paid family and medical leave to employees. In January 2018, President Trump endorsed a version of limited paid family leave in his state of the union address. In February 2018, the Trump administration proposed a 2019 budget that included paid family leave for new parents. The proposal did not extend to personal illness or caring for family members beyond newborn or newly adopted children. The proposed budget recommended a six-week period rather than the 12 weeks of the Family and Medical Leave Act. It suggested that the current unemployment insurance system, which employees and employers pay into and states administer, would serve “as a base.” States would be responsible for creating their own leave programs under this plan. Bear in mind that the president’s proposed budget is not law but rather makes suggestions for a Congressional investigation. Congress must take action to make laws on any items in the president’s proposed budget. Senator Marco Rubio is discussing a plan that enables new mothers to take some of their Social Security benefits early. So, if they took six weeks paid family leave, they would start their Social Security benefits six weeks later than they would have otherwise. Many members of Congress support the FAMILY Act proposal sponsored by Senator Kirsten Gillibrand and Representative Rosa DeLauro, which would increase payroll taxes to pay employees for leave for birth, adoption, and family and medical leave for up to 12 weeks. Paid family leave laws are increasingly gaining ground at the state level. Five states–Washington, California, New York, Rhode Island, and New Jersey, as well as Washington, D.C.–have enacted their own versions of paid family leave in the form of employee and employer-funded insurance benefit programs. California, New Jersey, and Rhode Island have programs that offer eligible employees four to six weeks of paid leave benefits. New York began a phased implementation of its insurance program in January 2018. While Washington, D.C.’s and Washington state’s laws took effect in 2017, benefit payments under their paid family leave insurance programs do not begin until 2020. A good summary of the paid family leave laws for the five states and Washington, D.C., may be found here. Many other states are considering paid family leave laws. Legislation that would implement some form of paid family leave benefits was introduced in no fewer than 22 states in the past year. It appears inevitable that legally required paid family leave is going to affect more and more businesses as time goes on. Businesses that are already covered by paid leave laws should take time to ensure they are complying with the requirements of their state’s laws. Businesses that are not already covered by paid family leave laws should stay informed about legislation pending in their state legislatures and in Congress. Next : Federal Employment Laws: Do They Apply to You?